If you ever intend to carry adults in the back seat, try it before you buy. Also, be sure to hit the highway for more than a few minutes to see if engine noise is going to be an issue on long cruises. The 2011 Dodge Challenger has retro style and blistering muscle-car performance in spades, but it's a surprisingly well-equipped, comfortable touring coupe to boot. Over the few years in which Chrysler has struggled, been bailed out, and quickly worked to rehab its product line, one model that's managed to bolster morale and the automaker's image all the way through is the Dodge Challenger. The 2011 Challenger coupe evokes the designs of muscle cars of the late 1960s and early '70s, appealing to the Baby Boomer fans of the original coupes as well as a new generation, by offering modern tech and comfort features within a thoroughly retro exterior that hearkens back to the 1970 Challenger. Depending on your perspective, it can appear as cartoonish, crisp and modern, or a blast from the past. At the top of the Challenger range, the high-performance SRT8 adds some modernity and a new exotic look in the way of faux-carbon-fiber trim and xenon headlamps, but its deeper front air dams and functional brake ducts give the design even more street cred. What's not available, appearance-wise, as a factory option inside or out is bound to be available as a dealer-installed Mopar accessory. Various striping packages, wheels, a Ram air hood, and suspension kits serve to give you whatever customized muscle-car look you want. 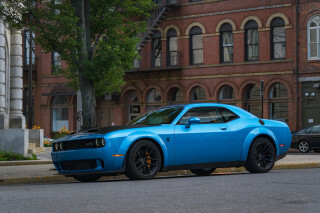 The base Challenger SE comes with a new 305-hp, 3.6-liter Pentastar V-6, and it remains the option for those who don't make performance the top priority but want this muscle-coupe's street style at a more affordable price. At the top of the range, the SRT has an exotic-like 470 hp and 470 pound-feet of torque. 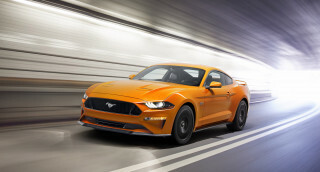 In either variant, as soon as the road turns curvy the Challenger reveals its greater mass and feels neither as lean and nimble as the Mustang nor as overtly athletic as the Camaro. What's mostly to blame is the steering, which feels overly light and imprecise. The Challenger has a very comfortable and well-appointed interior, for the most part, and it's a step quieter and more civil—as well as roomier—compared to other sports cars or pony cars. But it's a different story for rear passengers; there are three seatbelt positions in back, and Chrysler claims best-in-class headroom, though if there are tall people up front, there's little or no space for knees or feet in back, and the very thick pillar lends to claustrophobia as well as a lack of visibility. On the bright side, the Challenger has a huge trunk. There's more than enough space back there—more than 16 cubic feet—for just about any long weekend. But the other big plus for comfort: The 2011 Dodge Challenger rides really well—better than most larger coupes—and the suspension damps out severe jolts without drama (or trauma). Interior materials have also been improved a bit for 2011; Dodge has added LED cupholders, a new hand-stitched leather-trimmed shift knob, and standard climate control, plus upgraded Nappa hide on Challengers with the available leather interior. 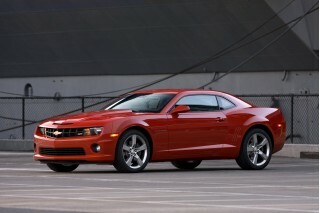 For 2011, Dodge has reconfigured the Challenger's feature list and bolstered standard equipment across the lineup. A new Garmin touch-screen navigation system is available, and it's not only simpler to use but functionally a step ahead many other original-equipment systems. Uconnect Web is also on offer, turning the Challenger into a wireless hot spot, and the available Sirius Travel Link suite brings real-time weather, fuel prices, sports, and movie information. A number of performance and appearance packages are offered to give the Challenger a custom look or a specialized driving feel. The downside of all these options, of course, is that you can drive the sticker price up toward (and past) the $40k mark for an R/T or near to $50k for the SRT8—where there's top-notch coupe competition from Audi, BMW, Cadillac, and Mercedes-Benz. Of all the American retro muscle machines, the 2011 Dodge Challenger is arguably the most retro on the outside, but it's appealing, cohesive, and mixed nicely with modern cues. Hearkening back to early '70s peak of American muscle cars yet embodying a host of more sophisticated modern touring coupe details, the 2011 Dodge Challenger can look either cartoonish, awe-inspiring, or both. The 2011 Challenger is a little taller and more chiseled that its inspiration, the 1970 Challenger, but it's iconic in its own right—combining macho touches from Dodge's other new cars as well as Ram trucks. A clear, crisp shoulder-line crease runs alongside, adding just a touch of interest to an uncluttered side, and the thin, horizontally oriented front grill and rear fascia give it a retro, aggressive look. From the side, the Challenger matches up nicely with the old car in profile in most respects—except for the huge wheels of the new model, of course. And even at the top of the range, the high-performance SRT8 adds some modernity in the way of carbon-fiber-look trim and xenon headlamps, but its deeper front air dams and functional brake ducts give the design even more street cred. What's not available, appearance-wise, as a factory option inside or out is bound to be available as a dealer-installed Mopar accessory. Various striping packages, wheels, a Ram air hood, and suspension kits serve to give you whatever customized muscle-car look you want. While the interior isn't nearly as edgy and retro-extreme as the exterior, it's a pleasant mix of modern trims and materials with a gauge cluster and plenty of dash design cues that give a nod to the past. In most trims, it's a dark, muted look; but depending on the shopper it can be nice departure from the somewhat more gimmicky interior of the Chevy Camaro. On the exterior, the Challenger remains anything but muted. New this year on the SR8 is a flamboyant Green With Envy green paint scheme, with black striping. Otherwise you have a choice between Billett Metallic Clear Coat, Brilliant Black Crystal Pearl Coat, Redline 3 Pearl Coat and Toxic Orange Pearl Coat. The 2011 Dodge Challenger offers strong acceleration now no matter which engine is under the hood, but it's not the best pick for hustling on mountain backroads. For 2011, the Challenger is newly available with a higher-output, 305-horsepower version of the new 3.6-liter Pentastar V-6 engine. That's 55 hp higher than the 3.5-liter engine it replaces, with higher fuel economy, too. To go with the new V-6, which is quite a bit lighter, the SE model's so-called touring suspension has been redesigned, including wider 18-inch wheels and tires. Brake pedal feel has been retuned, too. Also newly available for 2011 is a Challenger Rallye with Super Sport Group, bringing a 20-inch wheel upgrade with performance tires and more of an R/T look. Altogether, there are three main models: V-6 Challenger SE, V-8 Challenger R/T, and the especially high-performance V-8 Challenger SRT8. Challenger R/T models remain powered by a 372-hp, 5.7-liter Hemi V-8, with a choice of a five-speed automatic transmission or six-speed manual, while SRT8 models get an even bigger 6.4-liter (badged 392 cubic inches) for 2011, producing an exotic-like 470 hp and 470 pound-feet of torque. 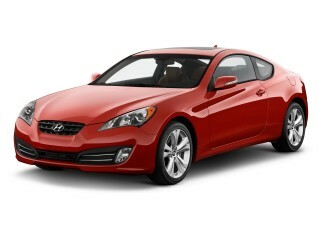 V-6 models come only with the automatic, though it includes AutoStick manual control. Although we haven't yet driven the Challenger V-6, it remains the option for those who don't put the priority on performance but want this muscle-coupe's street style at a more affordable price. The rest who value performance will want to go with one of the HEMI V-8-powered models, the R/T or SRT8. Hemi-powered R/T models feel strong and quick, with plenty of torque off the line and plenty left for high-speed passes. But it's the top SRT8 that's hot and blustery, with an old high-powered muscle-car feel and the right sounds to go with it. In any of these versions, you can't go wrong with the automatic transmission, which deals well with the torquey engines, but manual is a great pick for anyone who wants to do the shifting; it's surprisingly light and precise. As soon as the road turns curvy, the Challenger reveals its greater mass and feels neither as lean and nimble as the Mustang nor as overtly athletic as the Camaro. What's mostly to blame is the steering, which feels overly light and imprecise. The 2011 Dodge Challenger is surprisingly more comfortable and practical than you might think, given its muscle-car pedigree. The Challenger has a very comfortable and well-appointed interior, for the most part, and it's a step quieter and more civil—as well as roomier—compared to many other sports cars or pony cars. The supportive front seats in the 2011 Challenger are great for road trips and somehow supportive and well bolstered yet soft; they're among the best seats in any Dodge vehicle, and the Alcantara-and-leather performance seats that are offered on the top-of-the-line SRT8 breath well and keep the driver in place. 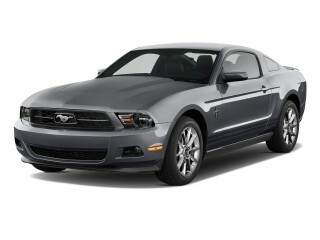 The cabin is a step wider than that of the Mustang, so there's an airy, spacious feel. But it's a different story for rear passengers; there are three seatbelt positions in back, and Chrysler claims best-in-class headroom, though if there are tall people up front, there's little or no space for knees or feet in back, and the very thick pillar lends to claustrophobia as well as a lack of visibility. Entry and exit are contortionist-level awkward as well and feel like concessions to styling. On the bright side, the Challenger has a huge trunk. There's more than enough space back there—more than 16 cubic feet—for just about any long weekend. The other big plus for comfort: The 2011 Dodge Challenger rides really well—better than most larger coupes—and the suspension damps out severe jolts without drama (or trauma). In either of the V-8 Challenger variants—the R/T or the SRT8—we found that the exhaust rumble that's music to our ears in short-distance cruising can turn into a droning irritant on longer cruises. The Challenger is fundamentally a pretty quiet, well-sealed vehicle, so with very little road or wind noise you tend to notice the exhaust boom all the more. Outward visibility from the 2011 Challenger isn't great, but safety equipment is impressive and past tests suggest that it offers good occupant protection. The official line is that the 2011 Dodge Challenger hasn't yet been crash-tested by either of the major U.S. agencies. But if you read a little bit between the lines, the structurally related Dodge Charger sedan is an IIHS Top Safety pick, with top crash-test results in all categories—which certainly bodes well for this muscle coupe. What's more, in last year's federal government (NHTSA) testing, the 2010 Dodge Challenger earned top five-star ratings in all frontal and side tests. Electronic stability control, anti-lock brakes, front side airbags, and side curtain bags all remain standard across the model line. And at the top of the line, the Challenger SRT8 gets a few additional performance-safety features, including Hill Start Assist, which helps you launch the car smoothly on uphill starts, as well as upgraded Brembo brakes. As we've noticed with several tests and drivers, outward visibility leaves lots to be desired in the 2011 Dodge Challenger. The high flanks and narrow windows already limit your frame of vision, but the thick rear pillar makes lane changes especially risky. This is a car in which a blind-spot system would be much appreciated. The 2011 Dodge Challenger offers a lot of features for a reasonable base price, but those who option up an R/T or SRT8 might be shocked at the sticker. Take a look at the feature list for the 2011 Dodge Challenger is definitely more than a no-frills pony-car knockoff. If you want high-end audio systems or luxury-car comforts, they're probably available here—and with seemingly endless performance kits and appearance packages, you can pretty much find exactly the version you want. For 2011, Dodge has reconfigured the Challenger's feature list and bolstered standard equipment across the lineup. The SE now includes automatic climate control, cruise control, a trip computer, keyless entry and Keyless Go, a power driver seat, a 60/40-split rear seat, and a six-speaker CD sound system. R/T models, in addition to the Hemi V-8 engine, of course, get performance disc brakes with vented rotors, a performance steering system, fog lamps, upgraded instruments, and special badging. And especially if you're getting an R/T or SRT8, if you're willing to spend some extra dough you can give them a number of quite different looks. The R/T Plus package, for instance, brings upgraded rubber and a better sound system, while the R/T Classic package is a throwback, with old-style badging, an eggcrate grille, striping, and functional hood scoops. A Track Pak brings a pistol-grip shifter, performance, exhaust, and upgraded brakes, among other things, while the Super Track Pak is for those who plan to take to the track, with a full-off mode for the stability control. The downside of all these options, of course, is that you can drive the sticker price up toward (and past) the $40k mark for an R/T or near to $50k for the SRT8. The 2011 Dodge Challenger V-6 is reasonably fuel-efficient for such a showy muscle machine, but the V-8 variants are still guzzlers. The 2011 Dodge Challenger is first and foremost a muscle car, which means that you shouldn't expect class-leading fuel economy or particularly green performance here. That said, Challenger V-6 numbers aren't bad at all with the new 3.6-liter Pentastar V-6: 18 mpg city, 27 highway. If you want the V-8, the Challenger is a guzzler whether you take it in R/T or SRT8 form—despite the so-called FuelSaver cylinder deactivation technology you get in automatic-transmission models. The R/T gets 15 or 16 mpg city and 24 or 25 highway, while the SRT8 gets just 14 mpg in the city.